A batch of this Tangerine Raspberry Iced Tea Recipe is the perfect way to welcome summer. Iced tea is simple to make, not too unlike making regular tea. Steep the tea bags in hot water, then cool the tea and add ice. For extra flavor try adding herbs, such as mint, or fresh fruit to the mixture. Typically you’ll want to add a higher ratio of tea bags to water because the ice cubes will eventually melt and dilute the flavor. Experiment around and see how you like your iced tea best. Add water to a medium-large saucepan or stock pot. Bring water to a boil. Add the tea bags, then turn the water off. Let sit for 30 minutes. Meanwhile, fill a pitcher halfway with ice. Remove tea from the stove and transfer to the pitcher. Add 1 cup of pomegranate juice. Stir to combine. Taste and sweeten as desired. 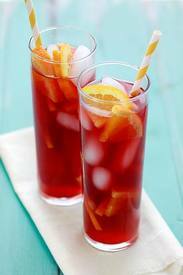 Serve garnished with orange slices and raspberries. A good way to sweeten tea without any undissolved sugar granules is by using a simple syrup. Combine a 1:1 ratio of sugar to water in a small saucepan on the stove. Heat until the sugar has dissolved. Let cool, then add as needed.